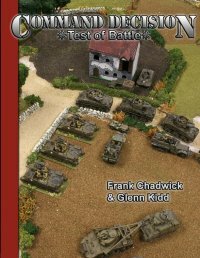 Command Decision – Test of Battle, essentially CD4, was released in late 2006 by Frank Chadwick and Glenn Kidd. Command Decision is a WW2 miniature rules set using platoon stands to represent battalion level battles. CD has been around for 20 years now so we think it qualifies as one of the classic sets of wargame rules available. The ToB website has a nice summary of the game and a description of what has changed from previous versions for players of the older titles; so we will not spend much time re-covering those topics. But we do think readers might find our initial impressions of the game useful. We want to stress that we have not played any games with ToB yet. The following comments are only from an unwrapping and initial reading of the rules. Components: ToB arrives as a shrink-wrapped rulebook. Once you unwrap it you realize there is a bit more there than you first thought. The back ‘cover’ is actually a cardstock reference card with the back cover of the book printed on the other side. It is made of a heavily coated stock. Also included is a sheet of counters. Unlike CD3 these counters are of the same coated stock as the reference card and are printed in color and will have to be cut apart. We were disappointed in the lack of regular cardboard die-cut counters but we assume the print runs of ToB are probably too low for that kind of thing. Owners of CD3 could still use many of their old counters. The rulebook also mentions ‘die-cut Fog of War’ cards. In reality these are just perforated cards printed on thick paper (not cardstock) – They are perfectly serviceable for their intended purpose but we would not call them ‘die-cut’ even if that is technically correct. PDFs of all the cards are also available on the ToB website. Finally you have the rulebook itself. It is an 8 1/2”x11” trade paperback, perfect bound book. It is 215 pages long and includes a few color pages although all the text is in black and white. Gone are the separate books of CD3. We preferred that format but others will probably like everything in one place. Our book had a slight binding problem where the spine is at an odd angle but it does not affect readability. There are 99 pages of rules, 50 pages of army and scenario material and then the remainder of the book is devoted to the army lists. There are a number of color and black and white photographs throughout. These range from poor to good. Our biggest issue with the photos is that no mention of figure scale is ever made. Our only concern here is that newcomers may get a bit confused. Overall the biggest disappointment with the book is the page design. It is perfectly serviceable but rather bland and uninspired. Compared to the lushness of the CD3 rulebook players will probably be disappointed from a design standpoint. Of course the black text on white pages will be easier to read than the green text on manila pages of CD3. The rulebook includes a two page introduction to World War Two. This may seem silly but ToB is obviously trying to appeal to new players and newcomers to the hobby so such a thing is not out of place. Following that is the two-page introduction also found on the website. The rules are broken into two sections, basic and advanced; unfortunately this delineation is not very clear but the advanced section evidently starts on page 64 with Advanced Command and Control. The rules themselves are very well written and make an effort to ease newcomers into the hobby. While ToB is certainly not a ruleset ideal for beginners, it makes a good effort at being approachable. The ‘Design Note’ callouts sprinkled throughout the rules are especially helpful in this regard. But we do miss the separate Battalion Commanders Summary starter pamphlet provided in CD3. The Rules: Players of previous versions of CD should see the website for what has changed but ToB will still be very familiar and should not take too much effort to learn. Veteran players of other historical rules also should not have any problems quickly learning the game. The rules are illustrated, sparingly, throughout. This is no Flames of War rulebook with lush illustration. It is serviceable at best. Similar to CD3, ToB includes a ‘Battles’ section. ToB not only includes six very nice scenarios (Western and Eastern fronts only) with maps and forces but also a generic battle-building system that even includes a map generator (again for Western and Eastern fronts only). This is a well done portion of the game. The army lists provided cover the major powers for the late-war period only. The ToB website already has lists for some minor powers and the other periods will come in expansion sets and possibly online as well. Overall the rules look very good and the changes seem sensible and should improve play. There is an errata sheet available for download but there are only a few items on it. The efforts of Frank and company are certainly evident here. The Community: Certainly one of the biggest changes from previous editions is the online community wrapped around ToB. CD had a mailer for years but only the more dedicated players would bother with such a thing. The main CD website was not even an official site. Now ToB has its own website complete with a very rich, and active, forum. This makes the game more approachable for newcomers and gives veterans a great sense of community. Closing: While CD3 veterans may be disappointed with the production values of Test of Battle we think they will appreciate the game itself. Newcomers from simpler rulesets such as Flames of War may have a slight learning curve but their efforts will be rewarded with quality, and reasonably historically accurate, play. We look forward to playing and what higher praise can one give? Also see our review of Stars and Stripes Forever. This entry was posted in First Looks, Miniature Wargames, WW2.